(Tetun) Grupu Agrikultura Manufahi (GAM) is a farmer group in Loro village, suco Betano, Manufahi municipality. The group started their seed production activities in 2007 as contract grower producing certified seeds of MAF released varieties. In 2013, they registered with MAF to produce commercial seeds as well. 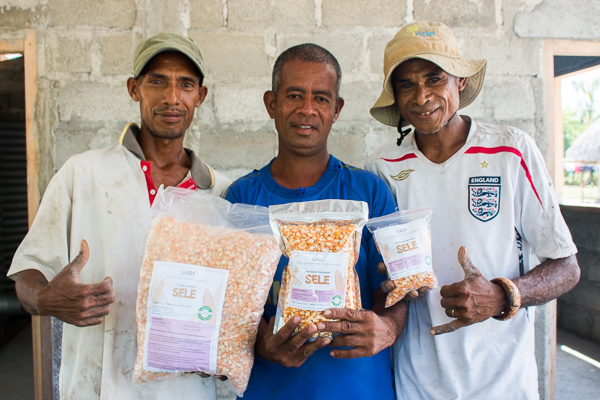 During the 2014-15 cropping season, the group was able to produce over 12 tonnes of commercial seed of Sele providing them with more than $18,000 from seed sales. That was a good year for the group. “It was a great achievement for us. It also motivates us to continue producing good quality seed for our nation,” said the group leader, Joao Mendes. Considering the benefits of selling seed, GAM understands the importance of seed quality, hence they assigned two group members in-charge of checking the quality of the seeds. “MAF Seed Officers have regularly monitored and inspected our plantation to control the seed quality. But we also set our internal quality control to ensure that members process the same variety and not mixed with other varieties during the planting until harvesting. “We do this because we want to maintain the seed quality. We want to avoid farmers buying mixed seeds as this might not give them good yield. If that happens, MAF or farmers won’t buy our seed again,” the chief alleged. The group also considers the importance of seed packaging and labeling to maintain seed quality. Since their involvement as seed producers, members are acknowledging the fruit of their labor. For the coming cropping season, GAM plans to add more members and maize field to both commercial and certified seed. Currently they have 25 members and 19 ha maize field in total – 16 members with 10 ha to produce commercial seed and 9 members with 9 ha to produce certified seed. GAM is also constantly looking for ways to improve their work to produce more good quality seed. Together with other commercial seed producers (CSP) around the country, they are hoping to meet the national demand for maize, and be ready when the government is poised to export their seed in the future.